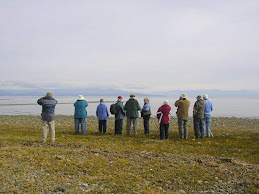 The Tuesday bird walk on May 09, 2017 went to the Shelly Road side of the Englishman River in Parksville. The morning was cloudy with calm winds. A singing Warbling Vireo greeted us at the start of the walk. We heard Pacific-slope Flycatchers singing in the forest for most of the morning. A Pacific Loon was heading up the Strait of Georgia. An adult Killdeer with a fledgling was spotted along the shore at low tide. 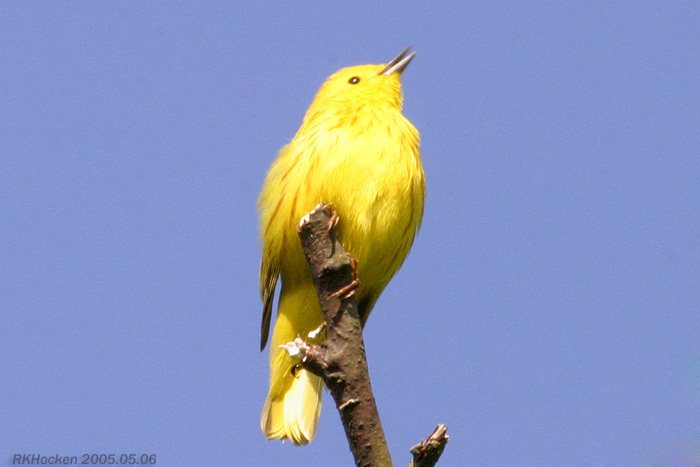 We spotted a Wilson's Warbler feeding just off the trail. A Sharp-shinned Hawk and a Turkey Vulture were circling high overhead. We saw a pair of Yellow Warblers feeding in a short tree near the trail. Barred Owls were seen perched in a tree at the end of the walk. The Tuesday bird walk on May 16, 2017 will be going to the Top Bridge Trail in Parksville. Meet at the Parksville Community Park at the parking lot near the Lions Club Kids Playground at 9:00 a.m. or at the Top Bridge Trail parking area along Industrial Way near Tuan Road in Parksville at about 9:10 a.m.